Programming the web and random technical notes. Here's how I automatically backup my mysql databases on my DreamHost account. I use three shell scripts and a cron job to run them at regular intervals. The databases get backed up hourly. The backups are saved hourly, daily, and weekly. The weekly archive gets a unique name and is therefore not overwritten. Note that I use the short option form (-p), so you cannot have a space between the option and the password. Complete documentation for mysqldump. The crontab runs the scripts on a regular schedule. Here is how I run the scripts above. By the way, don't forget to make the scripts ececutable (chmod +x from the command line or use your ftp program). # |      |       |       |       day of the week (0-6 with 0=Sunday). Of course put your email address on the MAILTO line. First login to your server via SSH in terminal(enable ssh from the "Users" web panel): "ssh username@mydomain.com"
Once logged into your server, list your current crontab file: "crontab -l"
Set your editor to vim (you can also put this in your bashrc or bash_profile): "export EDITOR='vim'"
now edit the crontab: "crontab -e"
type "i" to enter insert mode, type or cut and paste your code in (if you cut and paste, use notepad or textedit or other real text editor, not MS Word, etc.) I think you need to have a line return (blank line) at the end of your code. Hit the "esc" button to exit insert mode, then type ":wq!" or ":x" to save and exit. Type "crontab -l" to check your work, then "exit" to log out from ssh. Restoring from your backup: "mysql -u user_name -p -h hostname database_name < dumped_file"
Movable Type assets (images, docs, pdfs, xls, virtually any document) can be uploaded and managed through MT's dashboard. A label, description, and tag(s) can be assigned. I use the asset tags to selectively list assets on my blog's index pages. The problem is that it is hard to remember what is the exact wording of the tag (capitalized, plural, etc. 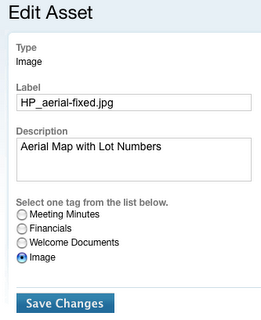 ), because tags are entered in a text form. And I certainly don't want my clients to have to remember which tags to use. 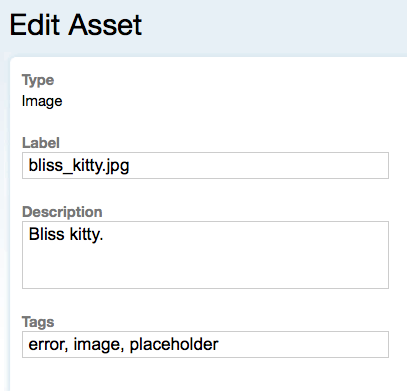 This limits the choice of asset tags, but then that is the point. I had to edit two MT system files to accomplish this. Fortunately, it's the same change in both files. <mtapp:setting id="tags" label="<__trans phrase=" tags="">"
label="<__trans phrase="Select one tag from the list below. ">"
Note that the "value" and "__trans phrase" values are particular to your project. Also more options can be added. If you prefer a checkbox list instead of radio (allowing multiple selections), just use type="checkbox". Creating a remote website mirror for development. Problem: Client needs access to up-to-date website files to make updates, but I don't want him to edit the live site. Solution: Create dev.mysite.com and an ftpuser for that domain. Use that ftpuser to place a mirror of the website within that subdomain. Since my links are relative, browsing works fine. Absolute links, of course, will remove you from the dev subdomain. Either way, replacing "www" with "dev" in the url gets you to the counterpart in the dev website. A client has a GoDaddy shared hosting account, hosting several domains on a MS Windows server. I needed some functionality which is only available on a linux server, so I went to the GoDaddy control panel and "downgraded" to linux. Technical support assured me that the conversion would be seamless, and although the transfer to linux would take 24 hours, the website wouldn't be interuppted (and I had no asp scripts to worry about). Needless to say, the _entire_ site, including several domains, broke completely upon transfer. In other words, additional domains within a Godaddy account are mapped to subdirectories of the main account. What broke during the switch from windows to linux server was this mapping. So while I could access http://domain_1.com/domain_2/index.html, I couldn't access this same file via http://domain_2.com/index.html (like it did before the transfer). Voila! All the sites (and containing links) were fixed. Note that 302 is for temporary redirects, while 301 is used for permanent redirects. I hope that I will be able to remove the redirects in a couple days, when GoDaddy fixes its internal mapping. update: Once GoDaddy fixed their mapping, I removed the 302 redirects.